Peak bloom for the trees lining the Tidal Basin isn’t expected for a few more weeks, but beginning March 15, cherry blossoms will be on full display just a few blocks from the National Mall — and visitors are invited to do more than just look. See photos. WASHINGTON — Peak bloom for the trees lining the Tidal Basin isn’t expected for a few more weeks, but beginning March 15, cherry blossoms will be on full display just a few blocks from the National Mall — and visitors are invited to do more than just look. Inside the Sakura Yume // Cherry Blossom Dream exhibit at ARTECHOUSE — an interactive art space in Southwest D.C. — touching, playing, even tasting, is encouraged. “For the longest time, we used to be very passive viewers. We were told, ‘Here’s a painting or a sculpture and you can observe and appreciate it, but you can’t touch it,’” said Tati, a founder and managing director at ARTECHOUSE, who goes by her first name only. 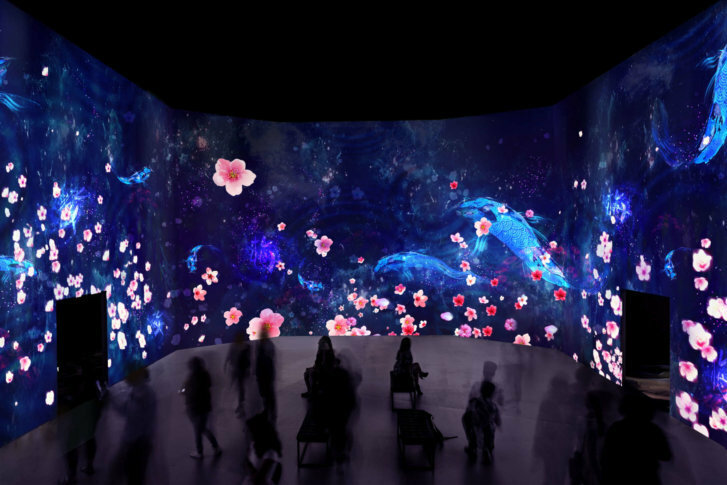 At the center of the exhibit is a large-scale, moonlit installation featuring floating petals and swimming koi fish that react to a wave, a shuffle or a spin. There’s also a lantern-lit street, lined with puddles that respond to footsteps, and a 3D sculpture of a koi pond, where fish appear when a hand hovers. A dark room in the back houses two 16-seat tables, positioned between blossom-covered pillars. On Thursday, Friday and Saturday evenings through May 6, visitors can partake in an interactive dining experience, where food is paired with different visual projections and auditory cues. “It’s something that I feel today’s society is really craving, to have that hands-on experience [with art],” Tati said. Just one flight up from the exhibit is ARTECHOUSE’s bar, which also features interactive art through augmented reality cocktails. Glasses atop coasters appear to be ordinary old fashions, but through the lens of the ARTECHOUSE app, they come to life. Sakura Yume // Cherry Blossom Dream is open daily from 10 a.m. to 5 p.m. Tickets can be purchased on the website. Admission to the interactive dining experience, $85, is separate.